Here's a more book-style map for a, what else, ongoing book project I've been writing, titled The War of One Thousand Petals. The basic idea is that, in this world, Ogedei Khan survived a decade longer than he did in our world (though not without a few alcoholism scares), allowing for Subutai and Batu to complete their conquest of Europe, eventually making it as far as the Atlantic coast of France. Thus, Europe was integrated into the Mongol Empire along with the rest of the world. A new Khanate, the Khanate of Blue Horde under Batu's second son, Toqoqan, is set up to cover much of Western and Central Europe, with its capital in Paris. Though a quarter of Paris was burned, the new and rich Blue Horde would rebuild Paris to a city that surpassed Constantinople in grandeur and was inspired by the great cities of Khanbaliq and Jiangning. 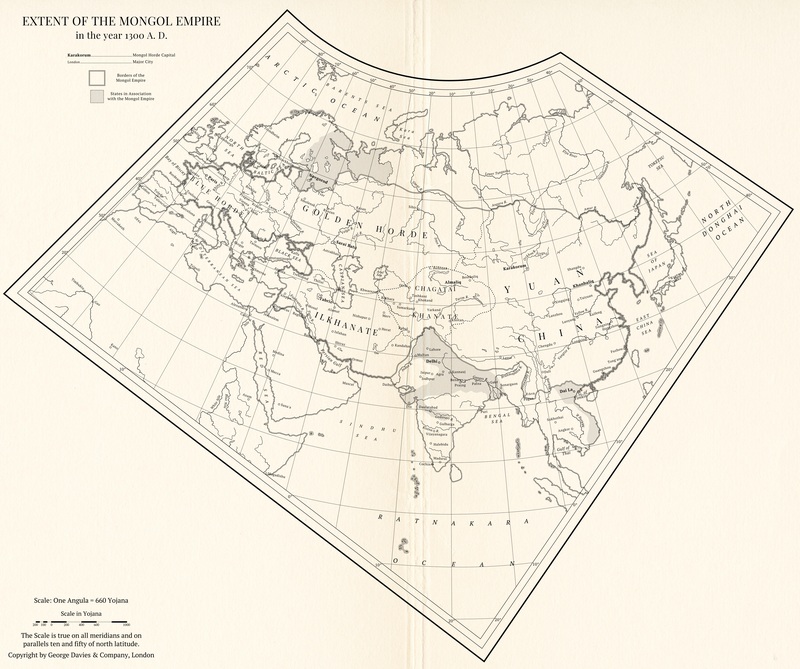 The map depicts the world in 1300, with the Mongol Empire still at the lofty heights of its power, though now split into different factions. The largest is, of course, Yuan China, but the others are rich and powerful in their own ways, and it is guaranteed that no matter what becomes of the future, the Mongols will have a massive part in shaping it. Want to see my art a day early? Consider supporting me on Patreon!